In 1997, Olikoye Ransome-Kuti, who has died aged 76, set the stage for awareness of Nigeria's HIV/Aids epidemic after he announced that his brother, the Afrobeat legend Fela Anikulapo-Kuti, had died of complications arising from HIV. It was a wake-up call for Nigerians, who had mostly ignored his 1986 warning when, as the health minister, he had declared that a 13-year old girl had tested positive for HIV. Ransome-Kuti spoke up because he felt a personal need to break the silence surrounding Aids in Nigeria. He said Fela's death highlighted the government's failure to address the crisis. The continuation of the conspiracy of silence, he suggested, during what was a "monumental catastrophe, is no less than criminal". Ransome-Kuti was a professor of medicine, a World Health Organisation (WHO) executive and arguably the best cabinet minister Nigeria has ever had, a model of transparency and incorruptibility. Appointed health minister by Ibrahim Babangida's military regime, his passion was the rejuvenation of Nigeria's crumbling healthcare system. It was while he was lecturing at the National Institute of Policy and Strategic Studies that he impressed Babangida. When that army officer seized power in 1985, Ransome-Kuti got the health portfolio. He made qualitative healthcare available to every Nigerian, especially through his primary healthcare programme, which emphasised the grass roots. He introduced free immunisation for children and created HIV/Aids awareness through advertisements and media campaigns. He also gave a new lease of life to family planning programmes that previous governments had ignored. Born in Ijebu-Ode, Ransome-Kuti came from a radical and distinguished family. His mother, Funmilayo Kuti, a woman rights campaigner, was the first Nigerian woman to drive a motor car and a member of the team which negotiated Nigerian independence with the British. She died in 1977 from injuries suffered from falling from a window after soldiers invaded Fela's nightclub, during the period of President Olusegun Obasanjo's military rule. His father was the remarkable educator and Anglican priest, the Rev Oladotun Ransome-Kuti. He was said to have flogged a white colonial inspector who flouted his directive, at a time when Nigerians treated their British overlords like demigods. Ransome-Kuti attended Abeokuta grammar school and Ibadan University before studying medicine at Trinity College Dublin (1948-1954). Back in Nigeria, he became house physician at the Lagos general hospital. In 1955, his father died at the hospital, and while visiting the corpse in the mortuary Ransome-Kuti found the bodies of infants who had died from meningitis and malaria. Saddened that children were allowed to die from such treatable and preventable diseases, he resolved to specialise in paediatrics. Ransome-Kuti was a senior house officer at London's Great Ormond Street children hospital and locum house officer in neonatal paediatrics at Hammersmith hospital's postgraduate medical school (1960-1962). After leaving his cabinet post in 1992, he became the chairman of the WHO's executive board. He won its Leon Bernard Foundation Prize in 1986 and in 1990, received the Maurice Pate Award from Unicef for his contributions to children's health and welfare. Ransome-Kuti, like his cousin, the Nobel Laureate, Wole Soyinka, was a long time critic of corrupt African regimes. Like his brother, the human rights campaigner, Beko, he was a defender of democracy and the rights of poor Africans. He recommended a South African- style truth and reconciliation commission to expose the misdeeds of Nigeria's past military regimes. He vehemently accused some African governments of stealing money targeted for medicine. In 2001, he told a WHO conference that only $12 out of every $100 contributed by donors eventually got to HIV patients in most African countries. "I have seen $300m dollar presidential palaces and $350m cathedrals in the midst of ill-health, poverty and destitution in various African countries," he said. He held various teaching positions, including a recent visiting professorship at Baltimore's Johns Hopkins University's school of hygiene and public health. He wrote extensively for medical journals and publications. He is survived by his wife of 50 years, Doherty Adefare Sonia, and three children. 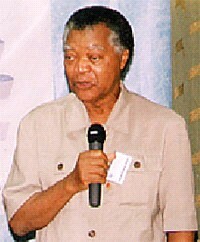 Olikoye Ransome-Kuti, paediatrician and campaigner, born December 30 1927; died June 1 2003.